Brown the onion in a saucepan with the oil and add the tomatoes, without the seeds, and the cinnamon. Stir well and turn the heat off. Heat the butter in a different saucepan, add the semolina and brown. Beat the eggs with the milk and pour in the saucepan. When set, turn the heat off and add half of the cheese. Arrange two layers of meat and eggplants and vegetables in an oiled baked pan. Pour the cream over it and sprinkle with cheese. Squeeze out as much water as possible and leave on absorbent kitchen paper to dry thoroughly. In the container of a food processor, place the onion, tarma, lemon juice, vinegar, sugar and bread. Process until smooth, scraping down the sides of the container. With the processor running, gradually pour the oil through the feeder tube. The oil must be added slowly enough so that it forms an emulsion. The finished consistency should be something like softly whipped cream, just firm enough to mound slightly when dropped from a spoon. The dip will get firmer as it chills. Scrape into a serving bowl and cover tightly. Garnish with a few Kalamata olives. Serve with crusty bread or pita wedges. Sauté the garlic and onions until soft. Add the tomatoes, lemon juice. Sauté for approx. 2 minutes. until the scallops are soft and cooked through. Add the GLORIA™ Classic Greek Dressing and serve hot. Put the eggs in the mix, discard the whites, add the whipping cream. If the mix is too soft add some crumbled white dry bread. Form the crab cakes, it makes about 8, and place in the refrigerator to firm. Fry in a pan in light heat with butter until light brown. Cut green peppers, carrots, and onion into small pieces. In a non-stick skillet pour the olive oil and cook in medium heat all the vegetables until lightly browned. Stir approx. ½ cup of hot water and continue cooking until vegetables are crisp and soft. In the same pot add the cooked vegetables, stir in the crushed tomatoes, a little sugar salt and dry basil. Remove pot from the heat and place the ziti in the pot. In the pot stir some Parmesan cheese, and place mixture into a casserole, break the fate cheese and crumble over the mixture, mix. Cover and bake for about 30 minutes, or until feta has melted. 1 boneless pork loin (2- 2 ½ ) lb. In a small bowl, stir together the parsley, the garlic, mustard, a little water, thyme, basil, sugar and GLORIA™ Greek Classic Dressing, salt and pepper. Place pork in a pan and spread with the mixture. Place pork in a roasting pan. Roast for about an hour and continuously brush the roast with a mixture of the lemon juice-oregano and extra virgin olive oil. Place the Swordfish cubes in the marinade and mix well. Put aside. In a large skillet heat the olive oil and add onions and tomatoes, over medium heat for 2-3 min. or until they begin to brown. Lower heat to low and add the oregano, garlic, salt and pepper and the sugar. Stir frequently and add more oil if needed. Continue to simmer until most of the juices have been evaporated. and place over the grill for 3-4 min or until fish is lightly brown. During cooking turn skewers once during grilling. Remove from grill and place in a platter. Garnish with parsley and some quartered lemons. The version of Greek Hummus that we serve at Café is somewhat different from its Middle-Eastern "cousin"; it is thicker and more pungent in garlic. Delicious with either fresh JOUJOUS Pita Bread or our homemade bread. Hummus is available at Market for $8.00 /lb. Place chick peas in a large pot of water and sit overnight. Drain the water in the morning. Return the chick peas to the pot and add salt and fresh water. Bring to boil, then simmer for about one hour until the beans are soft and tender. Drain the water and save the cooking liquid. Place the cooked beans in a food processor, add the garlic, lemon, tahini and ¼ to a ½ cup of the cooking liquid. Add the oil slowly until a smooth paste is formed. Place fish in a baking dish, put the rest of the lemon juice, olive oil, garlic, and GLORIA™ Classic Greek Dressing. Bake for approx. 6 min. Remove pan from oven and squeeze a ½ lemon over the fish. Marinate the salmon steaks in GLORIA™ Classic Greek Dressing and sprinkle the oregano all over the fish and squeeze plenty of lemon. Leave in marinade for about 4-5 min. In the meantime preheat the oven to 375 F.
Place salmon steaks in baking pan and pour all of the marinade over the steaks, squeeze some lemon over it, drizzle the rest of the Greek oregano. Bake for 10-15 min. or until the salmon is tender and soft in the center. Serve with a peasant Greek salad or tossed green salad. The grilled fish that we prepare at Nabeel's® Cafe & Market is genuinely Greek! There is little that is done to the fish, except brushing it with Extra Virgin Olive Oil and giving it a general sprinkling of oregano. On the table is a bowl of Extra Virgin Olive Oil, lemon juice, and oregano with a little salt and pepper that has been mixed & stirred real well. Make 4 shallow diagonal slashes on each side of the fish (depending on size of filets). Mix the oil with oregano and lemon in a bowl and brush the fish, inside and out, with the marinade. Prepare the grill. Place the fish in a fish grill holder. Grill the fish for about 15 minutes by brushing the marinade every time you turn over (must turn over about 5 times in 15 minutes). If the tail is kind of burned-up do not be alarmed. Remove the fish from the grill and place in a platter and keep warm. Pour about 3/4 of the marinade over the fish on both sides. Serve with Greek peasant salad, Feta cheese and crusty bread. The Greeks are passionate about onions; big ones, little ones, red ones, white ones, raw or cooked in almost everything. If you like to nip on raw onions, you will love these crunchy rings just as they are on plates of assorted appetizers. The longer they marinate the less hot and more flavored with the marinade they become. Place the onion rings in a bowl. Combine the boiling water, vinegar, sugar, salt and pepper in a bowl. Pour over the onion rings. Cover and set aside for 6 to 24 hours in a room temperature. When ready remove the rings with a slotted spoon and sprinkle with parsley to serve. If you ask any Greek what is his or her favorite dish is, the reply will probably be "Roasted Lamb". If you inquire further, they will start to describe the taste and the crackling skin of the Roasted Leg of Lamb. This recipe has been requested by several of our customers and from two good friends of my wife's "Our Lady of Sorrows" choir. This is the food Greeks associate with religious and family Feasts - Easter, Christmas and other joyous occasions. Fragrant with garlic, oregano, and basted with fresh lemon juice, which compliment the flavor of the lamb meat. The potatoes cooked in the same pan, absorb all the flavors and juices and become tender with crispy tops. Make about 15 slits with a sharp knife al over the lamb and insert in sequence, garlic, a pinch of salt, pepper, and oregano. Do the same for all other slits. Cut each potato in half and peel. Cut the half potatoes in long slices and place in the pan. Squeeze 2-3 lemons over the lamb and the potatoes. Sprinkle oregano over the leg of lamb and the potatoes. Pour the olive oil over the lamb and the potatoes. Pour the water over the lamb and the potatoes. Warm the oven to 350 F. Place the pan uncovered in the oven and cook for approximately 1 hour. Periodically check the lamb and baste with the juices. With either a meat thermometer or a sharp knife check to see if meat is done. When meat is done turn the oven to BROIL at 450F, for about 5 minutes, or until the surface is deep brown and crackling. Remove from the oven, carve the lamb and serve with the potatoes. Basil is the key ingredient in pesto sauce. Add to an ordinary salad-or French bread slices with tomatoes and mozzarella- and these appetizers become extraordinary. Toss with kosher salt and let stand for 1 hour for juices to form. Toss hot pasta in the sauce. Add salt and pepper to taste, garnish with pinenuts. The best-known type of gnocchi are those from Northern Italy made with potatoes and little flour. To make 4 servings peel 1 ¼ lb potatoes and boil until very tender. Drain and mash until very smooth, then mix 1 egg and season with salt and pepper. Add 3 ½ -4 oz flour a little at a time, stirring well (with a wooden spoon) until you have a smooth sticky dough that forms a ball on the spoon. Turn out the dough onto a floured surface and knead for about 3 minutes, until soft and smooth. Cut the dough into 6 equal pieces and with floured hands rolled these into sausage shapes about ¾ inches in diameter. Slice the dough into ¾ inch discs. Hold a fork in your left hand and press the discs against the tines just hard enough to make ridges, then flip them downward off the fork so that they curl up into elongated shell shapes. Gnocchi should be poached in a sauce pan of lightly salted, barely simmering water. Drop the gnocchi into the water in batches and cook for about 5 minutes; they will rise to the surface when they are done. Scoop out the cooked gnocchi with a slotted spoon and transfer to a plate. Gnocchi can be served like any pasta as a first course, or a side dish of a main course. Any pasta sauce is suitable for serving with gnocchi. My personal preference is with a creamy Gorgonzola sauce and a glass of Tsantali Cava red wine. If you do not want to go through the trouble to make them yourself you can buy an excellent quality of gnocchi at Nabeel's® Market. Most of our recipes are recipes that we use at home, either from my family (Krontiras), or my wife's family (Mastropasqua) This one is from my wife's uncle Cosmo, that lives in Toms River New Jersey. Thank you zio Cosmo, everyone loves it! Take all of the ingredients, tomatoes, garlic capers, parsley, onions and put in a pot and mix real well. Pour in the extra virgin olive oil on them. Sprinkle salt and pepper to taste. Let all of these ingredients simmer, on medium heat, for about 25-30 min. and right before it comes to a boil remove from the heat and let it cool down. Place fish fillets in a baking pan and pour the vegetable mixture, evenly over the fish. Cover with aluminum foil, and bake at 400° F. for 35 minutes. 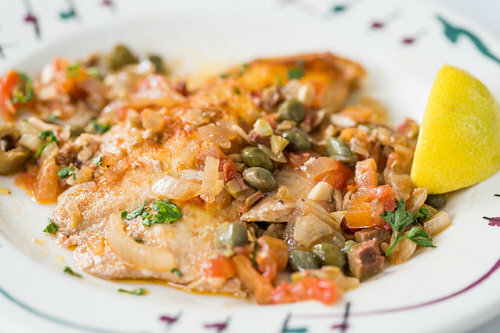 Serve hot in plates with plenty of mixture over the fish and serve with crusty Italian bread. Most of our recipes are recipes that we use at home, either from my family (Krontiras), or my wife's family (Mastropasqua) This one is from my wife's family, my mother-in-law cooks for us those time that she stays with us. Preheat oven to 375 degrees. In 2-quart casserole, combine rice, onion, oil. Add tomatoes, broth, paprika, oregano, ground pepper, roasted peppers, and bay leaves. Stir, then cover and bake for 25 minutes. Stir in peas and continue to bake, uncovered, for an additional 25 minutes or until the broth is absorbed. Add salt remove bay leaves and serve. Cook pasta in boiling salted water until al dente Reserve 1 cup cooking water and drain pasta in a colander. While pasta is boiling, cook garlic and red pepper flakes in oil in a 12-inch heavy skillet over moderate heat, stirring until garlic is golden, about 5 minutes. Stir in zest, then lemon juice, salt, pepper, and ½ cup of the reserved water and bring to simmer. Toss pasta in sauce with parsley. If pasta seems dry, add more of the reserved cooking water. Set oven to broil. Place pork on rack in broiler pan. Mix honey with the oregano. Mix remaining ingredients. Brush honey mixture evenly on top of pork chops (both sides). Broil with tops 4 to 6 inches from heat 7 to 8 minutes turning once and brushing with the honey mixture, until slightly pink when cut near the bone. Discard any remaining honey. Serve with salad using fresh spinach, artichoke hearts, tomatoes Kalamata olives and extra virgin olive oil, for a real Greek treat. Rub eggplant slices and tomatoes with extra-virgin olive oil. Sprinkle with salt and pepper. In a barbecue grill, grill eggplant until brown and tomatoes until charred, about 10 minutes, and then cool. Cut eggplant into cubes, and tomatoes into about 1-½ -inch pieces. Cook pasta in a large pot of boiling salted water until tender, or "al dente". Drain pasta and return to same pot. Add eggplant, tomatoes, garlic, olive oil, basil and ¼ cup of cheese to pasta and toss to blend. Season to taste with salt and pepper. Serve warm and sprinkle the rest of the cheese on pasta. This easy side dish (takes about 8 minutes to prepare) begins with slices of precooked polenta from the supermarket. We add melted cheese and diced tomatoes for a tasty topping. In a small bowl combine tomatoes, parsley, salt and pepper; set aside. Brush both sides of polenta slices with olive oil. Place polenta on grill over medium heat and cook for 5 minutes or until underside is golden. Turn slices over and top with Fontina cheese. Cook polenta for about 5 minutes longer or until cheese melts. Transfer polenta slices to platter and top with tomato mixture, the remaining olive oil and serve. Cook pasta in a 6-8 quart pot of boiling salted water, until al dente. Place Kalamata olives (after you take the pits out), basil, garlic in a food processor until finely chopped. Add cheese, salt pepper and oil and blend to a thick paste. Transfer the Kalamata Pesto into a large bowl. Stir ½ cup of the cooking water (from the pasta) into pesto, and then add pasta and toss until well coated. Serve immediately. Sprinkle with freshly grated Parmesan. * Instead of using the food processor I use a mortar and pestle. Does this make it taste better? I think so. But since many of you may not have a mortar and a pestle, that's why I have the food processor on the recipe above. In a sauce pot, prepare pasta in boiling salted water. Cut arugula in different sizes. In a large serving bowl, toss together arugula, walnuts, extra-virgin olive oil, and lemon. Add pasta, salt and pepper and mix all together until everything combines. Sprinkle with parmesan cheese and serve. Brush the lamb chops with olive oil. Squeeze lemon on both sides of the chops. Sprinkle pinches of the oregano-salt-pepper mix on both sides of the lamb chops. Grill about 2-3 minutes on each side and squeeze lemon each time you turn. While chops are cooking add the onions and sliced tomatoes to the grill pan and sprinkle both with oregano and salt and pepper. Transfer the chops in a platter and squeeze lemon on them. Cook the spaghetti in a large pot of boiling water. Add olive oil. When tender and firm to the bite (al dente) drain in a colander. Add the butter and toss thoroughly, keep warm. Remove any bones from the tuna and flake the flesh. Put it into a blender with the anchovies, olive oil and parsley and process until the sauce is smooth. Pour on the sauce on the pasta and toss quickly using 2 forks. Transfer to warm plates, sprinkle parmesan cheese and garnish with the olives and serve warm, with Italian crusty bread. Buy the fish cleaned and gutted. Slice the fish on each side in 3 places. Sprinkle inside and out with oregano and salt. Brush the inside and outside with the olive oil. Place fish in an oiled baked dish. Arrange sliced potatoes around the fish and pour remaining lemon juice over potatoes and fish. Pour the rest of olive oil over the fish and the potatoes. Sprinkle remaining oregano on fish and potatoes. Cover baking dish with aluminum foil. Cook in 350º F for about 35-40 minutes. Remove cover and continue to cook for another 10-20 minutes or until fish and potatoes are cooked. (If the fish is cooked already, remove the fish and place in a platter) and continue cooking the potatoes in the juices. Serve immediately, with boiled green vegetables such as spinach or endive. Another excellent variation ( from the island of Rhodes ) - in the last 15 minutes of cooking add 3 tablespoons of drained and rinsed capers, mixed with olive oil. Place onions, tomatoes, garlic, oregano, extra-virgin olive oil, olives, in a bowl and mix well. Oil a baking pan and place tilapia fillets in the pan, being sure fillets do not touch each other. Sprinkle paprika on top of tilapia. Add all of ingredients from the bowl over the tilapia. Sprinkle capers over fish. Pour olive oil, salt and pepper. Bake for 15 to 20 minutes until fish becomes soft. ** Note: When purchasing tilapia, be certain that is fresh and is not from a Far Eastern country. It may cost a bit more but is worth the extra. Over 1,500 Ethnic and gourmet items from the far corners of the world are available at Nabeel's® Market, enabling you to make the most tantalizing recipes. So, visit Nabeel's® Cafe & Market for a tour of the world! Soon selected items will be available on our web site for ordering! Cook the spaghetti in a large pan of lightly salted water and add 2 tbsp of the olive oil. When the pasta is tender, but firm to the bite (al dente) drain in a colander. Return to the pan and sprinkle it with the remaining olive oil. Shake the pan well and cover. In separate small pans, heat the brandy and the cream to a simmering point; do not let them come to a boil. Combine the cream with the brandy. Cut the smoked salmon into strips and add to the cream mixture. Season with cayenne pepper to taste and stir in the chopped parsley. Transfer the spaghetti to a warm serving dish-bowl, pour the sauce on top and toss thoroughly using 2 large forks. Scatter the Feta cheese over the pasta and garnish with parsley. Serve immediately. Rinse and dry the turkey (hen). Season with salt and pepper all over as well as the cavity. Prepare the stuffing. Place the turkey (hen) in the middle of a roasting pan , breast up. Peal and quarter the potatoes, rinse them and arrange evenly around the turkey (hen). Pour the lemon juice and olive oil over the turkey and potatoes and sprinkle with the herbs. Pour a cup of water and roast in a preheated oven at 400 F. for 2.5 to 4 hours. A little water may be added if it looks as if it is drying up. Sauté the onions and garlic in the olive oil. Add the livers and sauté for 5 minutes, then add the rice and sauté for a few more minutes. Add the hot water, salt and pepper and simmer slowly for 3-5 minutes until most of the water is absorbed but the rice should remain hard. Take off the heat and add the pine nuts, the sultanas and the rest of the herbs. Mix well and stuff the turkey, leaving a little room for expansion. Using a sharp knife, cut 4-5 diagonal slashes on each side of the fish. Place a sprig or two of rosemary in the cavity of each fish and half the lemon slices. Place fish in a foil-lined dish brushed with oil and brush the fish with the rest of the oil. Cook in a preheated oven at 375ºF 35-40 minutes until the thickest part of the fish is opaque. Today, it is very difficult to prepare a dish exactly as it was prepared in ancient times. We do not have the right utensils or the many different spices that were used by the ancient chefs to bind together the recipe. In the last few centuries many people, including chefs, philologists, archeologists, and botanists, have become interested in the art of ancient Greek cooking, starting from pre-historic times and the Greek years. By continually testing, modifying and improving, they have managed to give us some recipes that have turned the tide back toward the first flavors used. They are good recipes that are tasty and enjoyable. For us Greeks, as we will see further down, the continuing thread of flavors doesn't seem to have been cut. In forgotten corners of our country, one is pleasantly surprised by food that is clearly prepared as it was in centuries past. Try the recipe below and let yourself go back the ancient culture of the Greeks. This recipe supposes to be over 2,000 years old! Heat the oil in a large saucepan and sauté the leeks and the celery until soft. Add the herbs, the cucumber, the water, and the wine. Mix well and put the tuna slices on top of the vegetables. Cover the pan and boil on a low heat for 30 - 45 minutes, according to the thickness of the tuna. Serve with rice and a green tossed salad.